The Schumin Web » JMU class reunions in September 2008: Cancelled due to lack of interest. JMU class reunions in September 2008: Cancelled due to lack of interest. JMU does so many things that make me laugh, and not in the hee-hee-that’s-funny kind of way, either. Unfortunately, it’s usually in a far more mean-spirited kind of way, as I laugh at some of the DUMB things that they do. I still remember back in 2003 when JMU announced that they were fighting spam, while at the same time constantly spamming the student body after they set a far-too-flexible process for campus organizations to promote their junk. Of course, once you graduate JMU, you lose the abovementioned spam, and start hearing from the alumni people. JMU recently sent me mail about the reunions for the classes of 2008, 2003 (me), 1998, 1993, and 1988. That’s five graduating classes right there. I know – I’m exhausted just reading all those different years. And JMU had a whole slate of events for people to do, and an overblown fee for the package (read: “Good lord, that’s expensive!”). My exact reaction was, oh, hell no, as I’ve been through the procedure with JMU’s cheesy event scheduling before, and it’s not that much different than going to Sea World, going from one show to the next to the next all day. 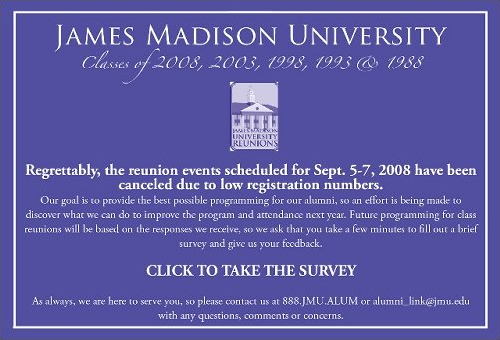 Note where it says, “Regrettably, the reunion events scheduled for Sept. 5-7, 2008 have been canceled due to low registration numbers.” The alumni revolted, as JMU soon realized that no one wants to go to the lame events that they programmed. And of course, they attached a survey. This one was a bit better than most I’ve seen out of JMU. Most of JMU’s surveys consist of yes-no questions with five answer options: Strongly disagree, somewhat disagree, neutral, somewhat agree, and strongly agree. I hate those kind of five-answer surveys, since often times organizations putting those kinds of surveys out do not include a space for free-form answers, likely because they don’t really want to hear what people really think. But this one was actually good. They wanted to know why we weren’t attending. Too expensive? Logistical problems? Other plans? Bad programming? They had check boxes, as well as a place to indicate what your first, second, and third most important reasons were for not attending. This “reunion” seemed too manufactured, just like too many of JMU’s official events. The university obviously planned it, and it shows, and bundling together a number of different class years at once that all happen to land on round numbers together fails to really recognize any of them as distinct groups. It would be better to see separate reunions organized by members of the various graduating classes. That would make the reunion far more special than just simply a slate of events planned by the university, which is quite reminiscent of Parents’ Weekend, which I’m sure many have less-than-fond memories of, being dragged around the campus by their parents all weekend from one event to the next to the next. Something that looks like it was organized by the people being reunited, something more “grassroots”, would be more appealing. Yeah, if I’m going to be going to a class reunion, I want it to be a meaningful experience. I don’t want to be intermingled with four other graduating classes where, by virtue of all the classes being reunited being five years apart, no two graduating classes spent any time on campus together. Each class had been gone for a year before the next one started up as freshmen. If JMU wants to bundle class reunions in groups of five, then they should consider inviting, say, classes of 2001, 2002, 2003, 2004, and 2005 together, since except for 2001 and 2005, all of these groups were on campus at the same time, and interacted together. That would be far more meaningful than five graduating classes that spent no time together at all. And then of course there’s the idea of the university planning stuff vs. the alumni themselves planning it. I’d be more apt to go to a reunion planned by class-of-2003 students than the university if the stuff going on was going to be meaningful. Actually, I’d be quite satisfied with having a class reunion on one night at a local Harrisonburg bar that served inexpensive drinks, or even at a ballroom at JMU, so long as the bar had cheap drinks. 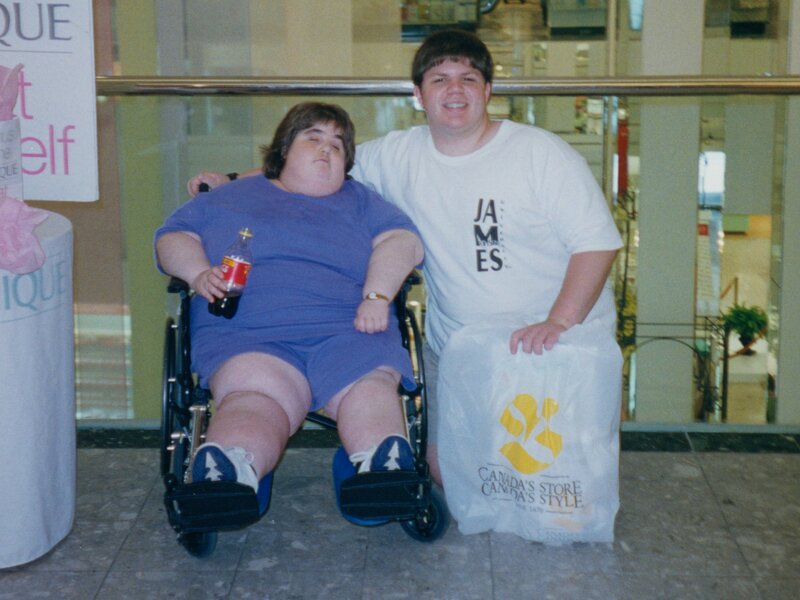 Web site: JMU Alumni Association, which planned these ill-conceived events.